Cut the cabbage into eight wedges and rinse with water. Place the chopped cabbage and the carrots on a baking tray. Drizzle generous amount of extra virgin olive oil over/in-between the layers of the cabbage leaves. Scatter some thyme and a pinch of sea salt and place the tray at the bottom of the oven for 20-25 minutes. Check and turn the vegetables around half way through. Meanwhile, mix all the ingredients for the dressing together in a bowl and set aside. Once the vegetables are ready, take out of the oven and serve on a plate. 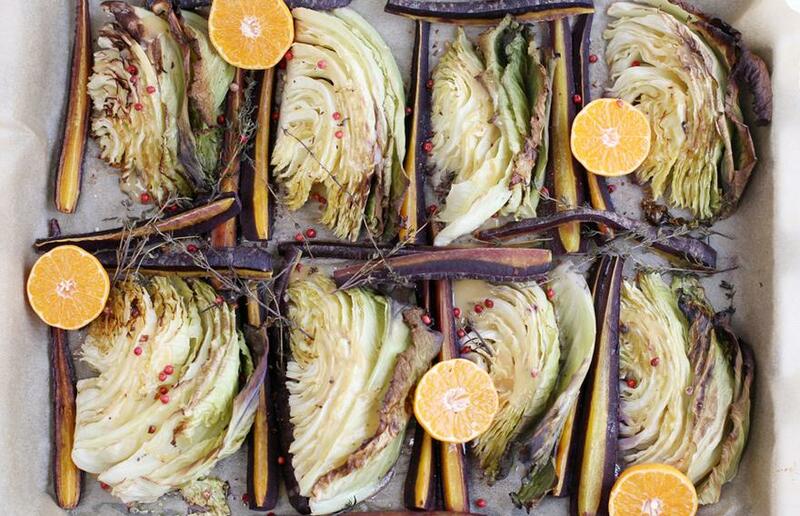 Pour the miso glaze between the leaves to flavour each layer of the cabbage. Serve warm with the halved clementines and a sprinkle of pink peppercorns or chilli flakes. 3 tbsp Clearspring Sweet White Miso?